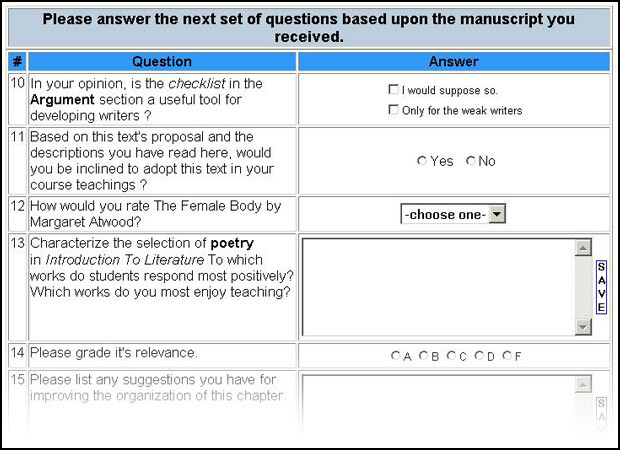 Ask questions in whatever format you choose: yes/no, multiple-choice, check-box, etc. Or allow longer, textual responses. TextReviews provides you with a rich set of question types to choose from and all have the ability to be customized using our advanced format controls. Complex rankings or specialized questions for readings and TOC's are all part of our solution for the needs of textbook reviews. Unlike most alternatives, TextReviews has been optimized to meet the unique requirements of textbook publishing. Making it easy to create and organize reviews is critical to sucessful projects. Our staff of experienced account managers will help you organize and format your questions to get the most information while making it a pleasant experience for your reviewers.